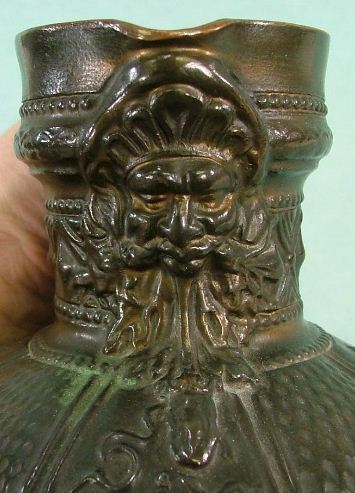 A copper clad Westerwald 3 liter relief stoneware stein showing three early Frankish kings: Pipen, Charles Martel, and Charlemagne. Metalizing, cool dipping, and China coatings are all forms of painted shoes and other items. These finishes are never plated and often damage the items to be plated rather than preserving them. Many companies promote “bronzing” when in fact are doing little more than painting shoes and other items. 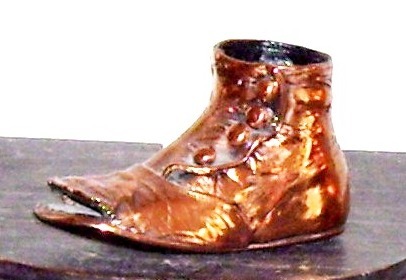 These companies add trace amounts of copper (or any other color) pigment to a lacquer or resin base and essentially dip or paint the shoe a “bronze” color. To ensure that your items are being plated with solid metal, look for the word “electroplated.” This is the only word that means genuine metal plated. Most of the companies you see advertising on the Internet are middlemen that forward the items to one of only 3 or 4 manufactures in the United States. 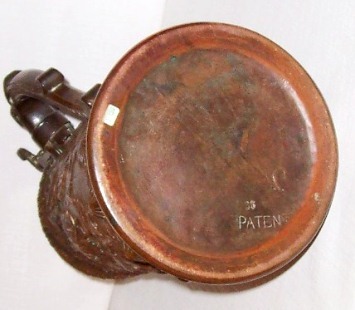 Most are marked “PATENT”, “Patent, or” PaTenT”, along with the original pottery’s company’s mold number, but not their makers marks they/ he bought from several companies.. 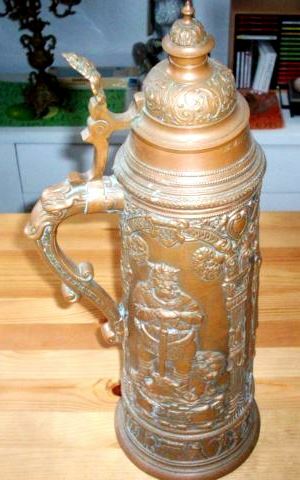 These German made “copper clad” steins are now” scarce” in the stein collecting world, and most might rate as a 4 or 5 on the Smith Paratore Rarity Scale. I believe this is due to a unique idea never really catching on when these were produced. Another indication is here are not many varieties to be found. While I haven’t seen them all, I would think of no more than 35 to 40 different molds were ever made. On October 1st 1890 the Congress of the United States passed the so-called ‘McKinley Tariff Act’, a law that was introduced by the 25th President, William McKinley. This law not only imposed the highest tariffs that the United States had ever placed on imports it also demanded that regardless of country of origin all items imported to the US had to be marked as such, ‘FOREIGN’. The act was later revised in two steps and while the first allowed the real country of origin to be used, based on the fact that Great Britain had already forced Germany to use ‘Made in Germany’ for their goods. The second change introduced the regulation that only standard English terms and characters were legit after the newly-founded state of Czechoslovakia in 1918 had started to use foreign characters (see ‘Čechoslovakia’ on marks (1918-1920)’). 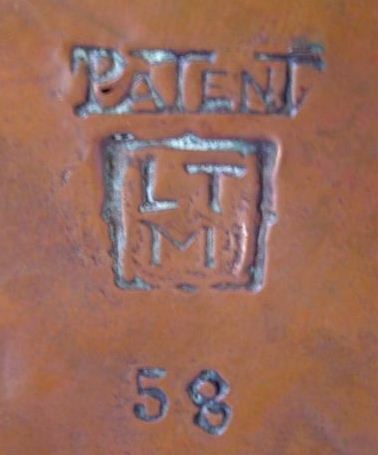 “PATENT’ – with distributor or retailer’s ink stamp. Super -sized photos for clarity. 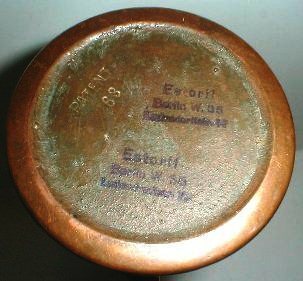 Chris Wheeler attributes this additional blue stamped mark, in addition to the stamped “PATENT”, to “Estorff” – a stein distributor, in Berlin. Ludendorffstraße 72, Berlin W35, Prussia (now the Federal City State of Berlin) . Kunstgewerbe-Magazin / Art trade shop. L. Thannemann et Cie. München. Munich. Bavaria. 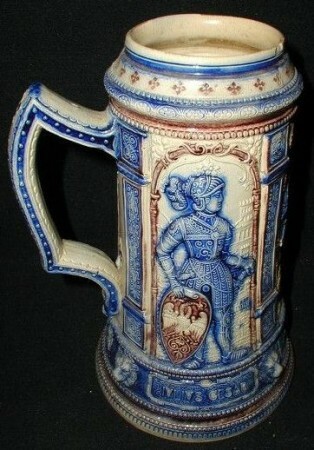 Purchased steins from: Marzi-Remy, Reinhold Hanke, Dümler & Breiden, Albert Jacob Thewalt. 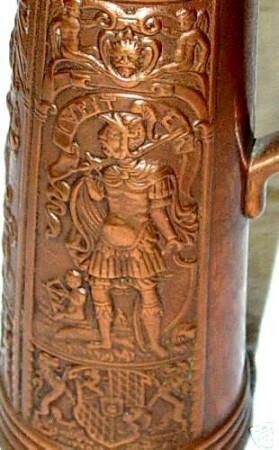 This mark is found on the large Dümler & Breiden (58) stein with Hermann’s battle scene on it, shown below. I agree. Now we have the information and research that Chris has provided us collectors, and for that I am very, very thankful ! A Circa 1900’s Westerwald serving stein. 9 inches, with no “PATENT” number. He thought those meetings were far beneath him and in fact was trying to get the whole idea shot down before it even got off the ground! 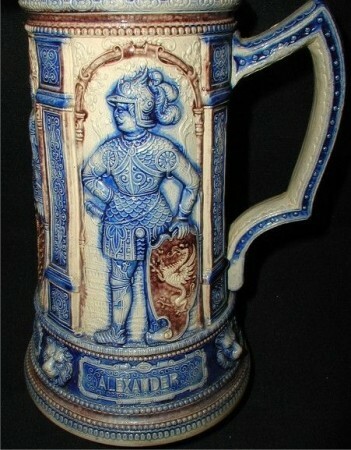 The glazed and fired on the inside BUT unglazed on the outside, pottery relief steins were ordered and received from many of the prominent German steins makers. These steins were then coated with a flux (most often a secret formula back then) and then put into a solution where they were electro-plated exactly like silver plated steins were. 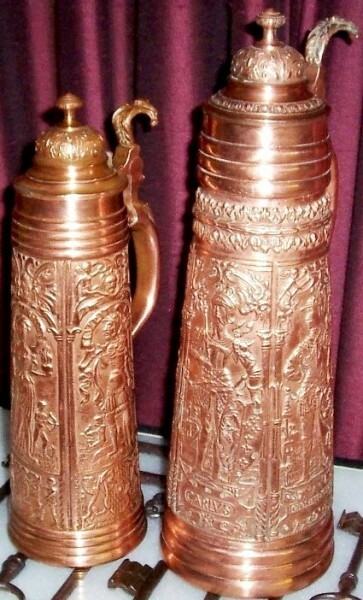 Due to the thickness of the applied copper coating, as seen on visual observation at the lips of these pieces, and on listening to the “empty space sound” when the copper coating when it has come loose from the stein body and is tapped as with a pencil / Therefore The steins had to be treated many times to get that thick, yet the details of the relief are not usually minimized at all, which I find to be interesting. In the photo below I’ve tried to show how the copper was “taken” on the area that was fluxed BUT NOT not on the inside body which was not fluxed! It will go to the top of the body’s rim, but never completely over it. Of course the lid, inside and out, and the pewter lid mounts / thumblift were coated with the flux also, so these parts also got covered with copper, and these areas are sometimes found to be partially to completely devoid of coating from being cleaned too hard and long.!! 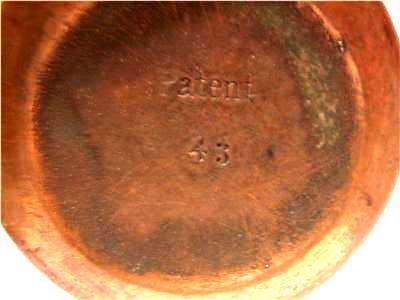 Detail of PATENT # 36, ▲ showing how the copper-cladding comes all the way up and just partially over the lip. Then it is polished, shipped to retailers, and sold to buyers, who are impressed with the luster. Two versions of ” PATENT” No. 36, ” The jousting stein” in stoneware by Thewalt. These are marked: No.’s 63 and 61. No. 61’s scene are shown a few photos below. This subject of this piece is also “Hermann, the German” fighting the Romans. A much different stein than the stein shown at the beginning of this page. 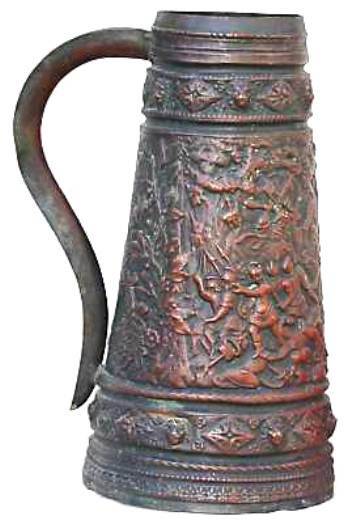 (See “Hermann’s story” @ http://www.steveonsteins.com/hermanns-story/ ) This is how one usually finds these pieces = dirty and with the copper plating very oxidized. 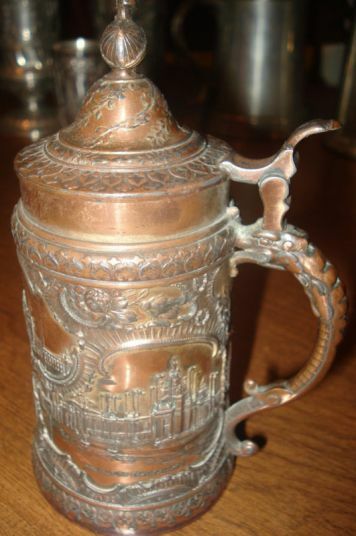 When I first saw this example I thought it was unusual to find a stein (not a server) without a lid. 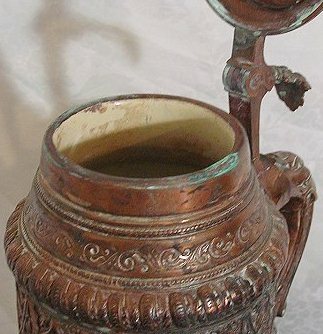 But it maybe not as unusual for this series of copper-clad steins, as below ▼ is a mug that definitely had a pewter lid put on later. [FWTD = a gift.] 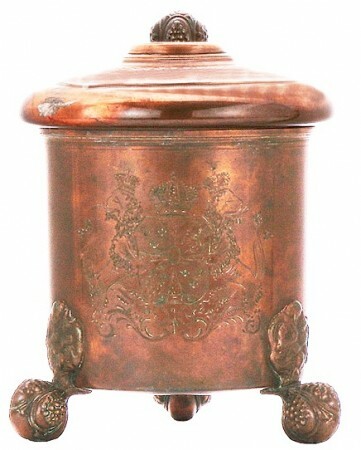 There is no indication on any part of the lid that it was ever “bronzed” originally and the coating later taken off. There would be some remains of the copper in some crack or connection somewhere, as always found on very worn silver plated lids. Original maker’s mold number = 1221. 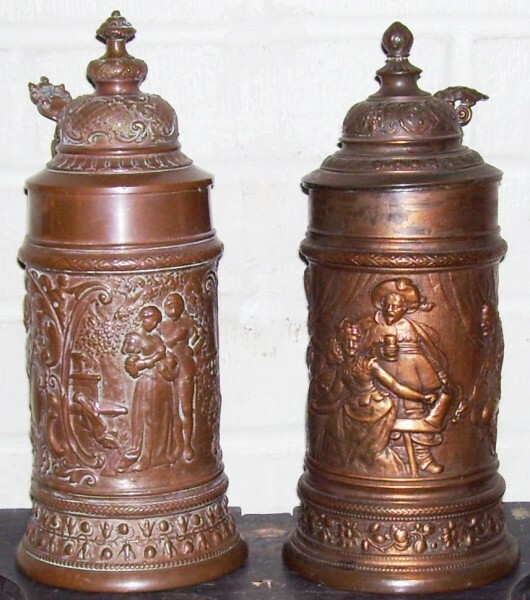 Two .5 liter German pottery relief steins that have been “bronzed.” “PATENT” with numbers = ? Also ‘as found’ and before cleaning. These were not as oxidized as most. 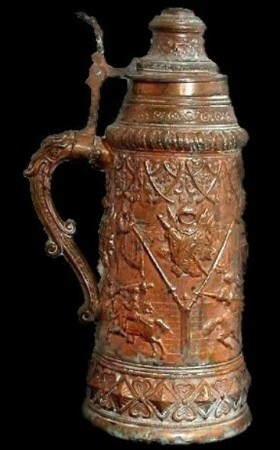 The stein on the right has some wear to the copper on the pewter lid’s lip. Not much one can do about it= copper paint and pencil lead dust rubbing for a darkener = ?? One of the above, cleaned with “King Midas” but not polished with “Maas” yet. See: http://www.steveonsteins.com/how-i-clean-old-copper-brass-pewter-and-silver-10-20. Maybe this is of some small interest to the Westerwald salt-glazed stoneware collectors. Here are very similar scenes shown on a .5 liter Westerwald mug. Circa 1885-95. 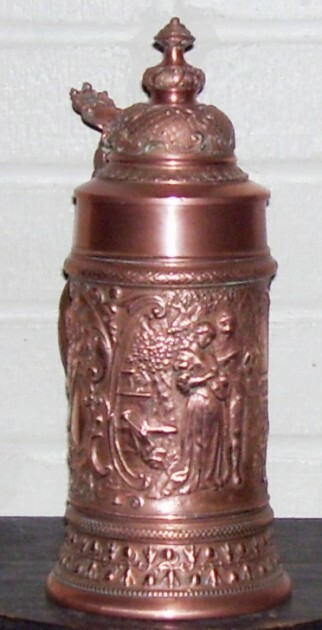 Copper clad wine server , “Moon Jug” – 14.5 INCH, ” PATENT 43″, which was a different maker’s same mold number but with a much different scene from the other #43 shown above. 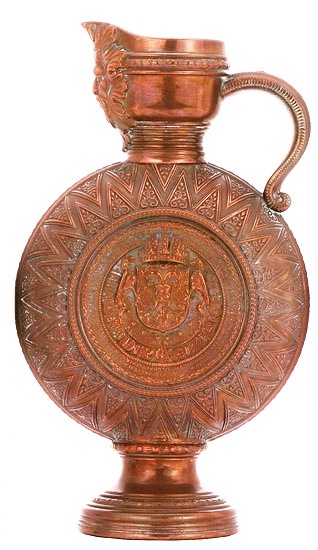 Below are other examples of “copper – plated” pieces (but should not be called COPPER-CLAD) that one might find on today’s stein market! 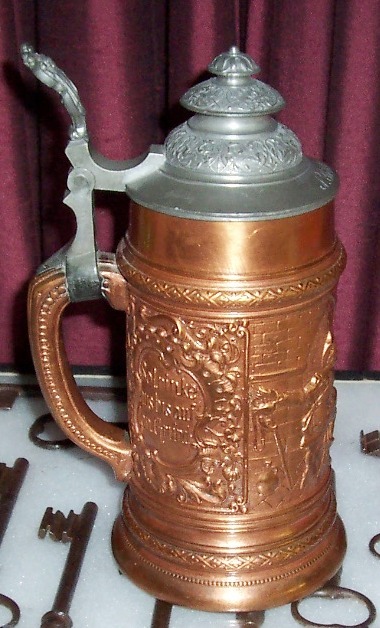 Another “copper – plated” pewter stein from the St. Louis World’s Fair, in 1904. 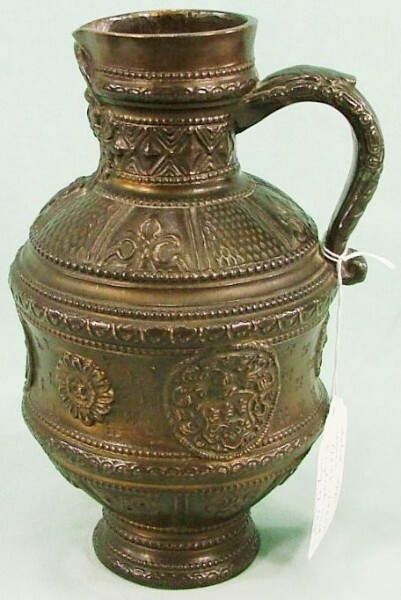 This is a one liter, 100% pewter stein that someone had copper-plated at a later date. It was made by F. Santesson in Stockholm. I do not think the plating was done at the factory, but that is a “SWAG” on my part. 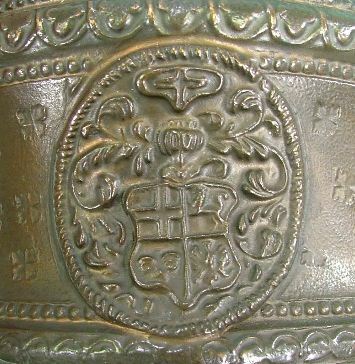 The Swedish Coat of Arms is engraved on the front prior to the plating.